Today we will be you another version of cold process soap. But before that let me tell you briefly why cold process soap is beneficial to you. Thats because it is the only soap made using from 100% natural ingredients. Therefore, you will be protecting yourself from artificial chemicals that might damage your skin. Many asked how about the Natural melt and pour soapbase by soaplab? Well thats made using extension of cold process soap too! Only its made by us in soaplab and requires hours of cooking while if you wanted to make something from scratch that is faster at home; you can make cold process soap. To begin with, you will need to combine lye, distilled water and an oil mix. The lye when combined with oils from SoapLab’s Oil Mix (saponifies) has glycerin in it, which acts as a moisturizer for your skin, while the oil mix nourishes it. The oil mix which consists of castor, olive, coconut and palm oil, comes with other benefits too. Coconut oil has been used for ages as it an amazing moisturiser which nourishes the skin, giving you a radiant glow. The oil mix provides you with vitamins and antioxidants to soothe and revitalize your skin. 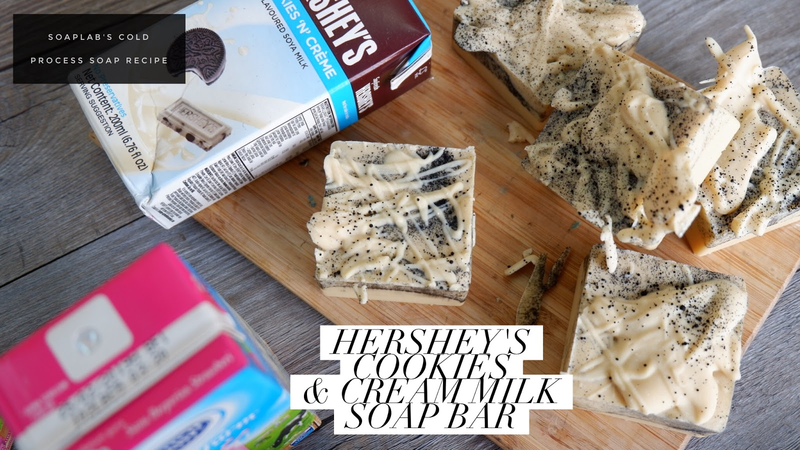 Since we are using Hershey’s Cookis and cream milk in this recipe; The soap needs to smell like it’s delicious namesake, so add choc chip cookie and dark choc fragrance oil. Also added in is titanium dioxide mica with black iron dioxide, to give the soap an appetising look. Finally, after taking a sip of the yummy Hershey’s Cookie’s and Cream milk, add it into your cold press. This is one yummy treat for all your senses.